The Cracker Barrel Cracker Barrel Hash Brown casserole is so well known. 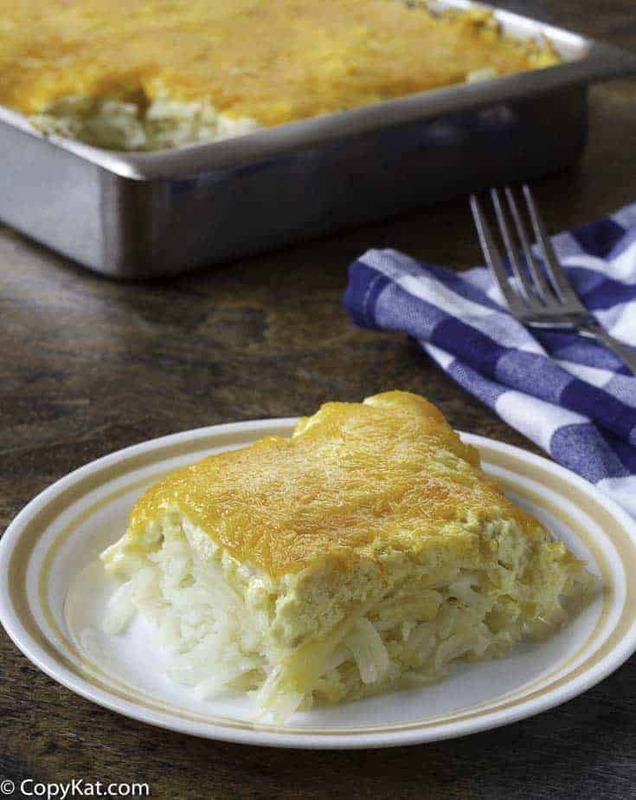 You can make this recipe at home; the Cracker Barrel Hash Brown casserole is easy to make. Hash browns, cheese, and more make for a delicious casserole. Vania submitted this recipe. The recipe suggests you use Crazy-Janes Mixed Up Salt if it’s available in your area. The Cracker Barrel hashbrown casserole menu item from the Cracker Barrel. I don’t care what time of day it is, this is going to be my side dish of choice. I used to hate it when they used to make it only for breakfast and when you got there too late, well this option wasn’t available for you. This is a simple recipe to make, and well it tastes incredible. This is one of those perfect dishes that you can make ahead of time, and heat up when you are ready to serve. So this casserole is a great option for holiday menus where you are overloaded with so many things to do. Assemble this ahead of time, and then pop this one into the oven when you are ready to serve this dish. If you enjoy Cracker Barrel Recipes you may want to check out these other favorite recipes available here at CopyKat.com. Cracker Barrel Loaded Hash Brown Casserole – This dish features several types of cheese and ground sausage is added to this recipe. Cracker Barrel Sunday Homestyle Chicken – This dish is only made on Sundays. This wonderful fried chicken recipe is amazing. It is a boneless skinless chicken breast that is fried to perfection. Now you can make this recipe any day of the week. 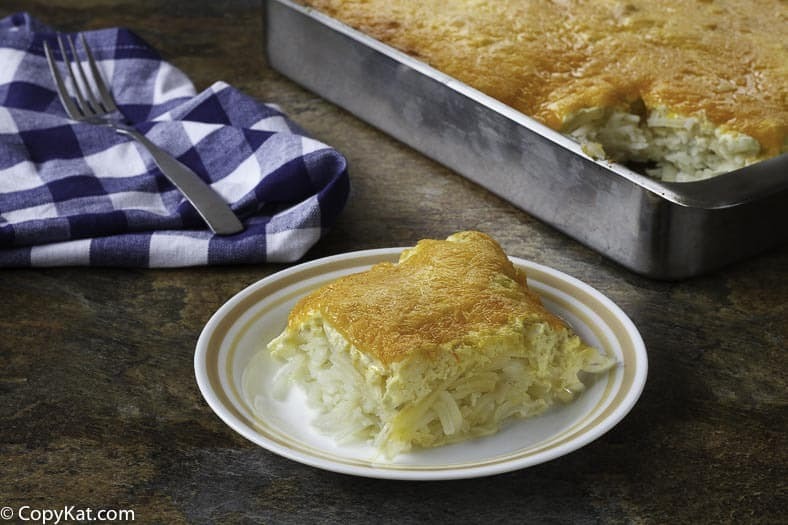 You can recreate the Cracker Barrel Hashbrown casserole with this easy copycat recipe. Cook hash browns, onions, and salt to taste in a skillet (you will need to add a little butter or oil). Cook until the hash browns are tender and brown. Drain the hash browns and set aside. Mix together cheese and cream of chicken soup in a separate bowl Add hash browns to mixture, then transfer into a buttered 2 qt. casserole dish and cook at 350 degrees for 30 minutes or until golden brown. You know this is the one that everyone wants, right? It’s so good. I’m glad you nailed it. This was wonderful. This will be my new go-to potato casserole recipe. YUM! I loved it! So easy to make! You just can’t go wrong with this recipe!! You can NEVER go wrong with a potato casserole! This is so delicious! I love this casserole! I love all your Cracker Barrel recipes! They always taste amazing! 1/4 cup of Sour cream is what is missing. Thank you for your suggestion! I will have to give this one a try. Looking at the ingredient list, I’d say you just about have it. Congrats for specifying Colby cheese (most people say cheddar, but the barrel does not use cheddar). Of note, at CB, we did not cook the hashbrowns first (yes, ours also came in 2 lb bags of shredded/frozen just like in the grocery store). We just threw all of it into the Hobart (basically, a large stand mixer) to blend and press into the pan roughly (make sure to leave the top tacky). Lastly, the Crazy Jane salt was not used in the casserole. Just plain old salt and pepper (but it is awesome to top a baked potato). I think they typically thaw pretty well when they get mixed.